The couple, who has been married 18 years, have been trying for a successful pregnancy for 16, but the road has not always been smooth. The doctor, suspecting either an ectopic pregnancy or else that the baby was younger than they had originally calculated, sent the pair to the hospital for an ultrasound where the heartbeat became immediately clear. “They found it right away,” Najar said happily. The couple decided to name their baby Adriel because, as Najar explained, in Spanish the name means her son will be a hard worker and less susceptible to negative influences. Although the couple is from Independence, Oregon, they travelled to Silverton because Najar’s medical provider has an office nearby and because they have been so happy with the care they have previously received at the hospital. Although Diaz will be returning to work after a two week paternity leave, Najar is considering staying at home to care for Adriel full-time. “This is a miracle and we want to take care of that miracle,” she said. 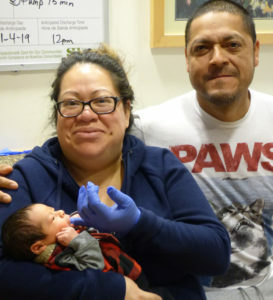 Also hailing from Independence are Glydes Luna and Pedro Vargas, who became the lucky parents of Eliz Valentina, the first baby girl of 2019 born at Legacy Silverton on Jan. 3 at 3:41 p.m.
“We were very surprised when they told us she was the first of the year,” Vargas laughed, cradling his eight-pound, two-ounce daughter. Parents to two older children – Ethan, five, and Ixabella, three – the couple are excited about this new introduction into their family.